Accompanied by the male DJ’s good friend Kent, the female Dawn Jogger made her way via two fast trains (Eurostar and TGV) from London to Macon, France – and then by car to Ameungy/Taize, France. That she’s returned here to remember the male DJ on the anniversary of his death somewhat amazes her. But she is so glad she did. 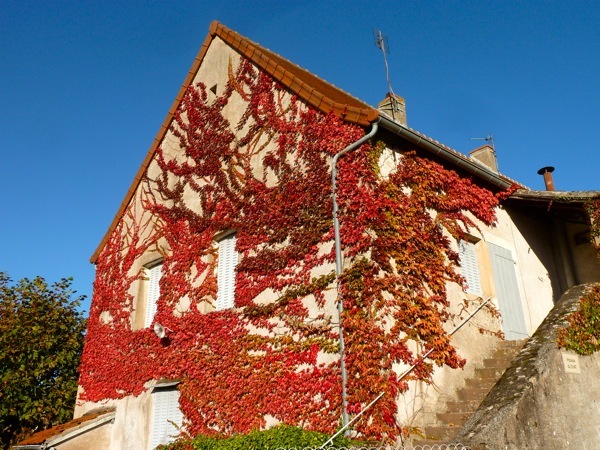 Upon arrival, an immediate short walk around the two villages was in order, starting at M. LeChat’s house, which is ablaze in ivy. It was here that the DJs spent a wonderful month in May 2010, joined at times be friends the Arscott and Bostocks. Somewhat ironically, she learned that M. LeChat had died just a few days earlier. Maybe he and the male DJ are not happily carrying on in French, discussing what’s changed and what’s stayed the same in Ameungy. (Of note, a few new houses, built in record time in French terms.). This entry was posted in Middle widow, On the road and tagged Ameugny, Taize. Bookmark the permalink.